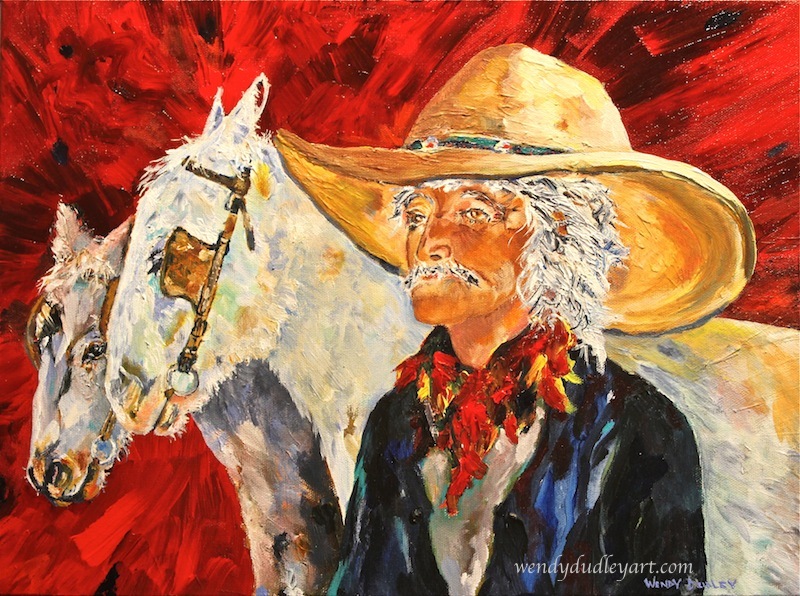 As a student of the history of mules and donkeys — the vaqueros, the prospectors, the soldiers and the farmers who relied on these sturdy animals — I was inspired to do this piece while thinking of a bygone era. But is it truly the past? Not really. In many parts of the world, donkeys and mules continue to toil, often with great burdens and in atrocious conditions. Let us salute these wonderful animals and those who try to improve their working lives. In this painting, I tried to capture a wistful expression, as if thinking of the years when the mules and their owner were younger. It is not a sad portrait, just a glimpse of someone who remembers those days when they weren’t so grey with age. His head is held high with pride. The three of them were a team. This entry was posted in About the Work, Musings on August 21, 2016 by Wendy.